There is always a danger when getting a German white wine. They tend to be sweet. Especially the inexpensive ones. They sometimes are so sweet that they will put soft drinks, like Coke, or 7up, to shame. Fünf is sweet, but not so much. More fruity than sweet, it is a nice drink to close out a glorious summers day. It has a nice balance of flavour that does not diminish when the cold leaves the glass. Truth be told I am quite taken by this wine as it is a perfect summer wine. The bottle is striking, having a white plastic wrap and very sparse lettering. The look is a bit too trendy. The marketing drivel on the bottle encourages the customer to, “add a little Fünf to your life.” OK I get it — “Fün begins at 5” the label says.” We all knock off work at five. This wine seems to be a development of brand marketing professionals. I would have preferred to think of this wine as the fifth blend that the winery made. The wine is great. The marketing a little obvious. A computer of mine has entered a deep sleep. I went to turn it on and nothing. I looked at the machine and scowled. It was a machine I used to play a few old games whenever I had the chance. There were also A few older bits of software installed on it that was useful on occasion. It was the only machine that can run that software. I bought the computer about 6 years ago for $69. It was a refurbished PC box that was reliable until the day it stopped working. The error is not in the computer’s hardware but for some reason the hard drive decided to pack up. Most likely a reformat will solve the issue. It is quite impressive how some technology can be stretched for a lengthy time while other technology falls by the wayside. One can think that some obsolescence is a conspiracy – but it isn’t. One company is trying to race ahead of another company in terms of market share and no one thinks of the consequences. This is how it has always has been. I am contemplating the time it will take me to bring the computer back to life. Is it worth it? Most likely I will find myself fixing this box because of sentimental reasons I will miss some of the old software, Flight Simulator and a bevy of Formula 1 simulation games. Nothing I really need but things I like to have around. 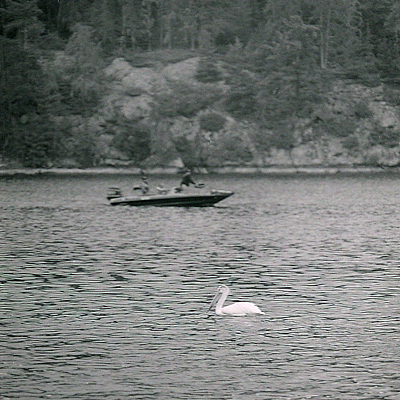 This pelican was photographed swimming in the Lake of The Woods. I always though that the pelican was a tropical bird, yet I subsequently found out that some, not all, migrate to northern Ontario. I saw a documentary film about Australian pelicans where again, some – not all, pelicans migrate to a dry lake in the middle of the Australia desert, when particularly heavy rains create this lake. What a strange yet exquisite bird. This is one of my favourite bands. 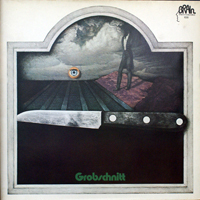 They are a strange lot – mixing psychadelic, progressive, symphonic rock music together. How did they do this? With humour. Not some kind of grand exotic humour one would expect from music of this ilk, but rather ironic and sophomoric humour. This is the band’s first album and the band is still looking for its voice. The songs are a melange of styles awkwardly fitting into each other – some better than others. The symphonic elements are here, there are but four “songs” on the album, notably that the first song is called Symphony. It, and most of the songs here are meticulously performed and a pleasure to hear. The only song that is “radio friendly” is the first song on side two –Wonderful Music — a naive little ditty that exists firmly in the flower-power era. I listen to this album in the context of their following albums and I hear where they are going musically. This debut album was a good one. I’ve written about this bar before. It is not a bad bar – but I would not really recommend it to anyone. I would acknowledge that it exists and I would admit, sheepishly no doubt, that I occasionally frequent said establishment. There is really nothing compelling about this watering hole except for location. And in business and life, is that not the essence. The beer here ranges from uninteresting to undrinkable. The wings are fair. The atmosphere is pedestrian. The decor is comprised of TV sets and whatever free propaganda the beer salesman foisted upon the manager. It is loud. Not obnoxiously, but a mix of forgettable tunes, two sports games simultaneously blaring as they are wont to do, and the regular hubbub of 30 or so humans trying to converse. Carrying a conversation at normal voice level is next to impossible – voices are raised – and that leads to the bar’s din. Now, I have to mention the waitresses. A nice lot, but I rarely see the same twice. High turnover at this place. I had no idea that they made white wine in Argentina when I pulled this bottle off the shelf. It just never occurred to me. I like the winery Trapiche as they make sove very decent inexpensive red wines. The first thing that struck me about this wine was the very faint pale yellow colour of the wine itself. You can’t see it in the picture because the bottle was empty when I took this picture. For some reason the colour of this wine did not appeal to me. The taste of the wine was also rather thin. There were a bit of harsh tones in the aftertaste but these were not too objectable. The wine is fine when chilled but gets progressively harder to drink as it warms up. At room temperature it is not bad, but one wishes it was chilled. It’s a mildly fair wine at a very affordable price. Probably good to make sangria blanca or wine spritzers if you are into that sort of thing. 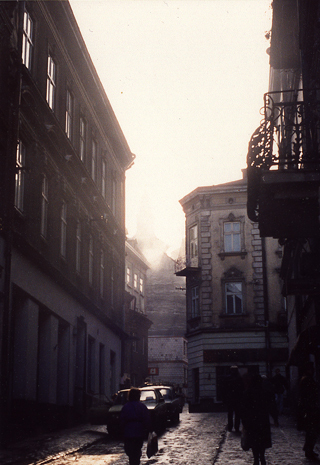 Morning in Przemysl, Poland in 1989. I had just gotten off the overnight train from Warsaw and was making my way to a friend’s house – to wake him up no doubt.